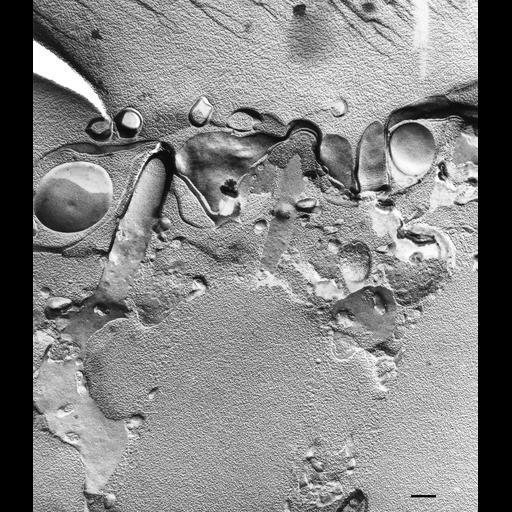 In a conventional freeze fracture view the membrane around the trichocyst tip is decorated with striations and IMPs. These decorations are found at the site where the trichocyst tip is associated with the alveolar membrane in the septum. Pores in the septum connect alveoli and organized IMPs at the base of the cilium indicate an association of the ciliary membrane with the proximal ends of the 9 doublets of the cilium and with the transition zone between the basal body and cilium. TEM taken on 9/27/78 by R. Allen with Hitachi HU11A operating at 75kV. Neg. 14,750X. Bar = 0.25µm.